Ordinary Miracles: so much Christmas, so little time! so much Christmas, so little time! We had a busy, but WONDERFUL Christmas. I'm not sure when it actually started, because we've been non-stop since December 16th, at our Christmas Open House. The 19th was South Side's Staff Christmas Party. We were so happy to host because we were able to put Mikayla down for bed at her regular bedtime and the boys went to bed before everyone left, giving us time to actually talk to the other adults at the party. John's dad was scheduled to arrive in St. Louis on Thursday the 20th, so after John drove down in the dense fog, his dad's plane was re-routed to Indianapolis. because of the fog. Unfortunately, the airport in Indy doesn't have a gate for the airline he was on, and he got re-routed AGAIN to Chicago. John came home late that night (actually early that morning), in the dense fog, but it wasn't for nothing, he did get a dozen Krispy Kreme doughnuts in St. Louis! In case you're wondering what happened to John's dad, they flew him back to St. Louis on Friday afternoon. John's mom was heading through St. Louis on her way to our house, so she was able to pick him up. Friday morning I was helping parent in Logan's preschool and Friday afternoon was Luke's Christmas party. Friday evening John's Mom, Dad and Brother arrived. Luckily for Ted, in from Costa Rica, and Ron, in from Florida, it wasn't too cold . . . yet. Saturday we went and saw Mr. Magorium's Wonder Emporium at the cheap theater and we all got in for $10.50! Luckily Mikayla was free because she only last about 1/4 of the way through the movie before we left to walk around the mall. Sunday morning we had church and were treated to lunch by the Wentz's! I LOVE going out to eat on Sunday afternoons! We rarely go to restaurants, because frankly, eating in a restaurant is not very relaxing with 3 kids. But, the adults far out numbered the kids putting the odds in our favor. 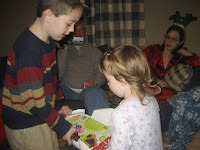 Monday morning, the 24th, we woke up and opened up presents with my family. 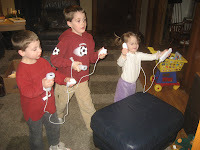 And as you can see in the photos Wii had a great christmas. That night we went to the Christmas Eve service (1st one for South West Campus). It was very family friendly and meaningful, giving everyone time to reflect on the prince of PEACE that seems so absent for most of the Christmas season. 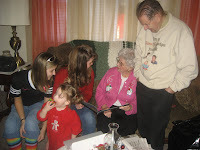 On the 25th, we headed up to my Grandparents in Lincoln and celebrated with them until about 2:00 p.m. Then we headed back to Springfield to have Christmas dinner with John's family. Unfortunately, on the 26th I woke up and felt AWFUL! I spent the whole day in bed asleep with some unwelcome interruptions I won't write about here. 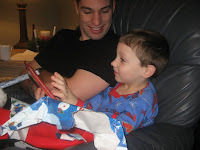 The kids and John went ahead and celebrated with the Wentz's and video taped it for me to watch later. After sleeping for nearly 22 hours, I opened my gifts in bed then returned to another unwelcome interruption and more sleep for the night! On the 27th we had a slow morning getting ready to head to my parents house for Hentrich Christmas. I was still not feeling great, but at least wasn't getting sick anymore. The worst part was that I couldn't enjoy any of the delicious Hentrich food! I sat around and felt like my head was in the clouds! But it was great to see family, especially my cousin Beth, who I haven't seen in several YEARS!!! 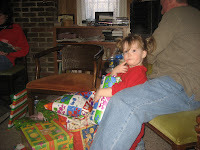 The kids had fun playing with my cousins Hannah and Mary, and my cousins daughter, Rory who is 4. After a quick 24 hour visit to my parents, We headed home. Over the Holidays we kept noticing that Luke was breathing strangely. He has to lift his chin up and stretch out his neck to breathe in. Especially if he's being active, he has to gulp in air to breathe. It really doesn't seem to slow him down, but raised my mommy concern. So we had called the Dr. and made an appointment for that afternoon. In my opinion it was a completely unproductive Dr. visit and so, I am still not sure why he's breathing strange. We are also looking for a new family Doctor. We spent the evening of the 28th, the 29th and the 30th with John's parent's. Mostly watching the kids play their Wii! After spending so much time with extra family and friends around we enjoyed ringing in the New Year with just the 5 of us. We stayed home, played games, put the kids to bed and watched a movie. It was relaxing and just what we needed to recoup from a busy Christmas. Now that it's all over and our Christmas decorations are down, I already miss the special excitement that Christmas brings. Biggest Sale of the Season!! !